Intro to teaching your dog his name and how to use it to curb barking at the window. Dogs bark. 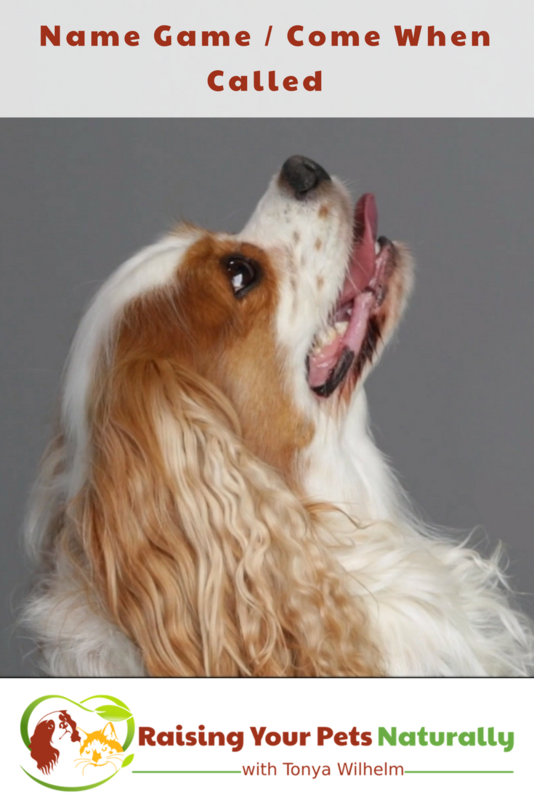 Barking is a pretty normal dog behavior, but one that can be quite annoying. If you have a dog who seems to bark all the time in the house at everything that moves, or is patrolling your windows, he is in a state of arousal all the time, and that is not good. Please note that this article is just one step in a variety of positive dog training tools to help curb your dog’s excessive barking inside. If your dog is constantly aroused, anxious, or stressed, please seek further assistance from a qualified positive dog behavior counselor. Teach your dog the value of his name. When I say, “Dexter,” that means for my dog Dexter to turn around and look at me, not for him to blow me off and ignore me. Your dog’s name should be a pleasant experience, not a punishment. In other words, good things happen to your dog when they hear their name. I start to teach a dog The Name Game during a planned dog training session. In other words, not when you are distracted, or your dog is distracted by his environment. Start your set-up without your dog seeing you “set up.” Place 20-30 tiny high-value dog treats in your pocket. By high-value, I mean something so exciting your dog will go crazy over the treats, like cooked chicken, steak, beef – whatever gets him to drool excessively! Then also place a small toy, such as a squeaker toy, in your other pocket. Start your dog training session when your dog is already hanging out with you and is not distracted. Say your dog’s name ONE TIME in a pleasant, high pitch sing-song voice. That moment when your dog turns his head to look at you, immediately mark that behavior with a “YES!” “Good!” or click if you are using a clicker. Follow quickly with a jackpot of 10 treats as you praise and fuss over him. Dish out the 10 treats quickly, but one at a time. You want him to feel like he just won the lottery! That’s it! That is the first stage in teaching your dog the value of his name. No distractions (not outside, not when he’s barking, not when he’s sleeping) right now. Practice this 10 times a day at random times for one week. You want your dog to be successful, not blow off his name. So, in the meantime, do not call your dog with his name if you think you are going to get the blow off. You are probably re-teaching him what the true meaning of his name is. * Oops! He didn’t look at you. Do not repeat his name, instead grab that squeaker toy you had in your pocket, start tossing it around and squeaking it while ignoring him. He does not get to play with it; you have a fun time with it by yourself. Grab his toy and go play with it yourself. Or whip out that tasty treat and pretend to eat it yourself. *Wait about 5 minutes, and if you think your dog is not distracted, try the name game again. Assuming he turns this time, jackpot as usual. If he does not look towards you, reevaluate the training environment. It is important that he wins at this level – and often – if you expect him to be able to do it with distractions. Tips and Bonuses– When you practice a set, you can add more rewards after your jackpot to really bring it home. For example, after your 10 treats, he gets his dinner or filled Kong toy, or gets to play or go for a walk – get creative. 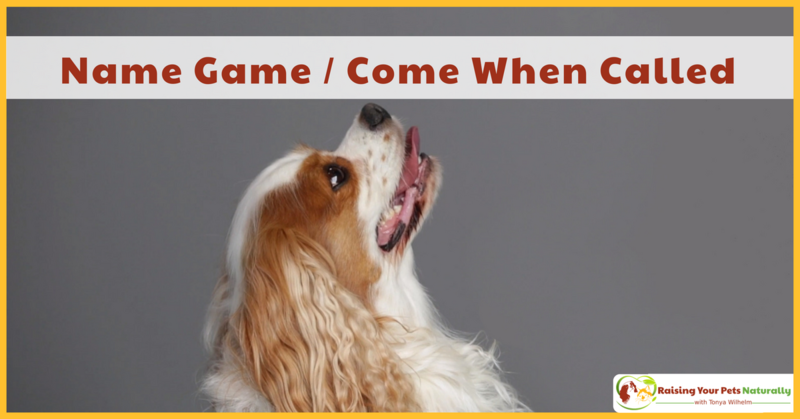 A quick and reliable name game is a precursor to come when called and everything else involved with getting your dog’s attention on you and not his environment. After a successful week of practicing your dog’s name without any distractions, you should have at least 70 repetitions of saying your dog’s name, with him turning and receiving a wonderful jackpot and hopefully some bonus rewards too. If this does not seem like the case, keep working on your Week 1 homework. Same rules as week 1 except this time you are going to start to add very mild distractions to your dog’s environment during your sessions. Again, you are looking for success, so be careful not to ask for too much yet. If you are unsuccessful, try something a bit easier and reset. Example: Your dog is calmly engaged in another activity such as looking out the window, moving around the house, playing calmly with a low-value toy…..get about 5′ away, say your dog’s name in that sing-song voice and that moment he looks towards you, your marker (Yes, Good, clicker) and jackpot of treats, 10 times a day! You did it! You got your first distraction under your belt. If this wasn’t successful, follow the same rules as week 1. It is super important to continue to reward these sessions, because you are still training, and you now have increased your criteria to make it harder for your dog. If you aren’t able to reward, don’t say his name. We want your dog to love, love, love his name, and we are going to start building his name into a small come when called behavior. I am going to repeat myself. Only move on if you have practiced your sets with success. Learning takes time, practice, and patience. You can’t rush it and certainly can’t move on if you haven’t practiced with success. You are going to continue with your mild distractions like week 2, except this time instead of being 5′ away, you are going to increase that distance to maybe 10′ away as you say your dog’s name (still in a sing-song voice). You are still marking (Yes, Good, clicker) your dog’s head turn towards you. Don’t wait until he reaches you. Remember that marker tells him he’s done it right, and the reward is coming. You are marking his head turn towards you (his attention); the coming to you is a bonus. Above we only changed the distance your dog had to get to his reward; this time, we are going to increase the distraction he’s coming off of. But you do not want to increase two things at once (distraction and distance), so this set will only be increasing his distraction, but you are once again going to be at the 5′ distance from him. You may even decrease the distance to make it a bit easier. You know your dog best, so slowly increase the distraction your dog is turning away from. So maybe there is a little activity outside the window, but he’s not going bonkers. Say your dog’s name in that happy tone, the moment he just turns his head towards you, mark and jackpot! As you are getting success with the head turn, you can start to increase the distance you are asking him to come. This is an ongoing training lesson. Over time, you can continue to build on your dog’s behavior and response to his name. If you start to lose him over time, decrease your criteria and rebuild again. If you want a reliable behavior, you will need to practice and to keep it fresh in his head that great things happen with the calling of his name. As you can see from the earlier weeks, you are slowly teaching your dog to come off of distractions and to come to you instead. This is how I teach dogs to not go crazy at the window. I practice coming off of boring windows and build to come off of exciting windows. Remember to pay (treat) that behavior or your dog will think the window is more exciting than you. It’s all about the payoff. You can’t expect your dog not to bark, I just think we should teach our dogs to come off of the things they are barking at and settle back down. Tips and Bonuses–Management, management, management. I say this all the time, but it is really the foundation of good dog training. Why do professional dog trainers get reliable behaviors quickly? Because they have good management and are not afraid to use it. If your dog is barking out the window all day long while you are at work and you attempt the name game, you are unlikely to be very successful in the long run. Why? Because your dog has a lot more practice doing the behavior you are trying to change. Practice makes perfect and if he’s practicing barking out the window all day long, well – you get the picture. Try to block off access to the windows while you are away. Maybe your dog is confined to rooms that do not have such an exciting view. Or maybe you use the decorative window film on your windows to block some of the activity. When you are home and you successfully call your dog off the window, if he keeps going back to the window to bark, try attaching his leash and take him with you. That way he can’t keep ping-ponging back to the window. Or maybe give him a stuffed Kong or treat-filled toy to keep him busy. Does Your Dog Respond To His Name? Tell me in the comments. Pingback: Stop a Dog from Barking Dog Barking: Why Dog Dogs Bark?